This weekend my first iPhone / iPod touch game Sahara found its way into the App Store. Sahara is a challenging puzzle game where you have to guide a camel through a labyrinth in the desert. If you like it, you can purchase it in the App Store. 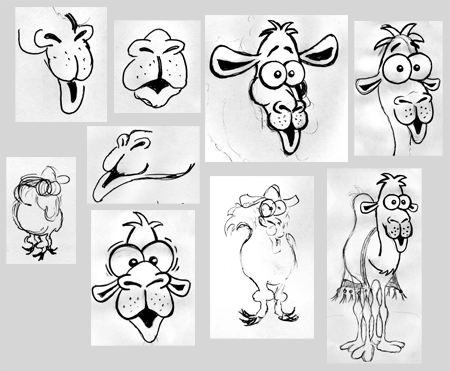 At the left is a rough pencil drawing of the camel how it was in my head. I did about five to ten drawings of that style or so. It was not exactly how I thought it should look like, but this one was pretty close. Then I scanned the drawing and did the final artwork directly on my Mac with vector graphics. I put the scan of the draft drawing underneath the image with 50% transparency as orientation. As you can see, I did a lot of corrections especially to the head of the camel. The funny eyes are bigger, the shape of the head is different, the ears are smaller and better aligned and so on. Although I own a Wacom tablet, I did all the graphics with my mouse, because I did no real “drawing”: I added a bunch of bezier paths for each stroke and then I corrected the points and anchors until I was satisfied with the result. 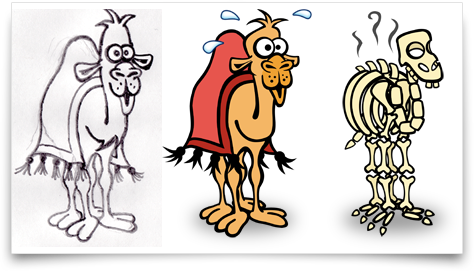 Note that I did not have a pencil drawing for the skeleton; I just used the final camel as orientation underneath and drew the bones directly on the computer as vector graphics onto it. After doing years of “just coding and coding” I really enjoyed doing this artistic work. Although in my opinion developing software is also some sort of artistic work, but I mean artistic in a graphical manner here. I did a lot of drawing in my childhood, but once I got my first computer it was displaced by programming so far. I am happy that I can combine both now. This entry was posted on Monday, January 26th, 2009 at 4:07 pm	and is filed under Development, Fun, General, News, Releases. You can follow any responses to this entry through the RSS 2.0 feed. You can leave a response, or trackback from your own site. Hi Mani, sieht echt gut aus und das Spiel spielt sich wirklich gut. Wünsche Dir viel Erfolg in der iPhone-Welt! Though the bevels on the text and logo are “not so great”. Plastic in egypt?! Stick to the cartoon theme, and remove the bevel gradients, leaving just full colours. Hi Mani, auch nach über einem Jahr mag ich Sahara noch, finde es aber schade, dass es keine Level und keine fortlaufende Wertung (die auch einen Highscore ermöglichen würde) gibt. Auch eine Variante gegen die Uhr wäre reizvoll. Time for Sahara 2.0! Hi Mani, die Grafiken sind echt grossartig! Es gefällt mir sehr gut, was du entwickelt hast. Mach weiter so!